 Beef and sausage ravioli lasagna. 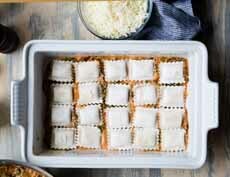 Pumpkin ravioli lasagna (both photos courtesy Taste Of Home). An even ravioli top (photo courtesy Oxmoor House). Adding the layer of frozen ravioli (photo courtesy Design Mom). March 20th is National Ravioli Day. We like ravioli in any form, but have been especially delighted with ravioli lasagna. What looks like a complicated recipe couldn’t be easier when you use frozen ravioli (no cooking required) and store-bought pasta sauce. Prep time is 25 minutes, bake time is 40 minutes. We adapted this recipe from one by Patricia Smith for Taste Of Home. 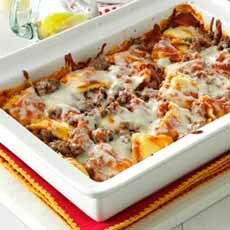 The recipe uses sausage or cheese ravioli and adds ground beef. But you can make vegetable ravioli, chicken ravioli, or anything you prefer. 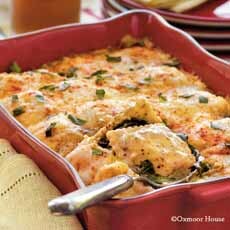 Here’s another Taste Of Home recipe for (here’s the Pumpkin Ravioli Lasagna (scroll down). Substitute ground chicken, turkey or textured vegetable protein (TVP) for the beef. Add veggies via two layers of frozen, thawed spinach or kale (pressed dry), frozen peas or medley. Substitute Alfredo sauce (cream sauce) for the tomato-based sauce. Substitute vegetable ravioli for the meat or cheese versions. We’ve even use ratatouille as the sauce, when we’ve made a large batch (pulse it into a chunky vegetable sauce. 1. PREHEAT the oven to 400°F. Cook the beef over medium heat in a large skillet, until it is no longer pink. Drain. 2. 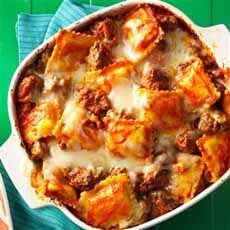 LAYER in a greased 2-1/2-quart baking dish: 1/3 of the spaghetti sauce, 1/2 of the ravioli, 1/2 of the cooked beef, and 1/2 cup cheese. Repeat the layers. Top with the remaining sauce and cheese. 3. COVER and bake for 40-45 minutes or until heated through. China gets the credit for inventing not only strand pasta—thin chow mein noodles like Italian angel hair, chow fun noodles like Italian linguine, chow fun noodles like Italian pappardelle, and stuffed wontons like Italian ravioli. When it arrived Italy, stuffed pasta (another name for the category is pillow pasta) was served with Italian-style pasta sauces. Some food historians believe the name “ravioli” derives from the old Italian word riavvolgere, to wrap. Others believe that the dish was named after a renowned 13th-century chef named Ravioli, who lived in the Republica di Genova (a.k.a. Genoa, today the Italian region of Liguria). The record on him is scant, but according to DeLallo Authentic Italian Foods, Chef Ravioli is credited with the invention of the stuffed pasta composed of two layers of thin pasta dough with a filling sealed between them. Interestingly, the Venetian Marco Polo, who brought the concept of stuffed pasta back from China, had subsequently become a soldier in Venice’s war with Genova. He was taken prisoner by Genova in 1296 and released in 1299, to return to Venice [source]. We don’t have dates for Chef Ravioli, but might he have heard about the stuffed wontons via someone who heard it from Polo? Given how scant the record is on the chef, we can say with almost-certainty that we’ll never know! Here’s much more on the history of ravioli.